One of the first engines I ever owned was a mantua Mikado 2-8-2. It was DC and grinds like crazy. i keep it on a shelf for nostalgia. In December 2011 I acquired an old HO Mantua 0-6-0 at our Nottawasaga Model Railway's Christmas party. Club members exchange gifts that should be valued around $10. However, the member who put this engine in the gift exchange is an N scaler so he had no use for it.The engine is lettered for the Turtle Creek. 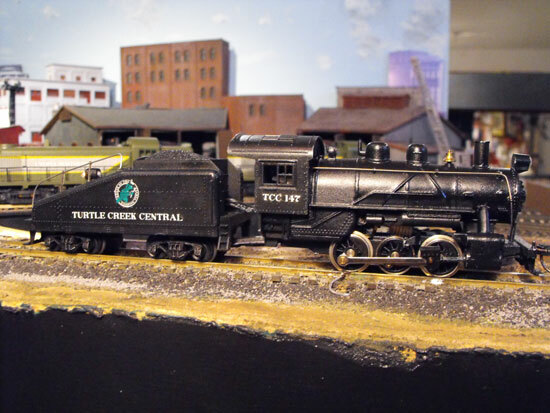 Model Railroader magazine had a project railroad called the Turtle Creek many years ago. This locomotive had been gathering dust in a box for a long time. Of course, it pre-dated DCC. I decided to install a decoder in it as a learning project and donate the engine back to our NMRC train club. When I disassembled the engine I confirmed that the worm gear on the shaft that drives the wheels was made of plastic. Re-motoring was not required. Good thing! That would mean getting the old gear off the shaft and replacing it, not an easy job. I figured the old motor would probably not exceed a 1 amp current draw. Holding the motor shaft so the wheels wouldn't spin and cranking up full 12 volt DC power indicated I was probably safe. I had an old Lenz basic decoder sitting in a drawer so I decided to give it a try. Because the worm gear on the shaft was plastic I could hook the orange and gray wires to the decoder directly to the motor. I used a Digitrax manual card for the colors. I figured Lenz would have followed the NMRA standards seeing as Bernard Lenz practically wrote the standards in the first place. My model railroad runs on Lenz. I could pick up the engineer's side (right) power through the red wire from the decoder. I didn't have to drill and tap the frame because I could connect to the screw that Mantua used for the frame. The gray wire (left side) would be supplied by the wheels on the tender. To connect the wires to the tender and still allow the engine to be separated from the tender I used a Miniatronics 4-pin micro plug connector. These connectors have one wire noted with a white dot to ensure plugging them together correctly. I wrote down which pin was being used for what so I wouldn't get confused. The connector wires are all black so it's aways a good idea to write down what you're doing. I used the wire with the white line and dot for the red wire and the two wires on the opposite side for the motor + and - connections. It appeared to be impossible to replace the headlight jewel with a bulb or LED because the boiler was a big hunk of metal. I connected a white wire to the remaining wire in the plug in case I ever revisit the project to try to install a headlight. Tip: Store screws and parts in a plastic sandwich bag if you don't have a container to put them in. (Eat the sandwich first). There was no opening in the plastic tender I could use to route the wires so I drilled a #50 hole in the center front of the tender. I used the female plug in the tender. By separating the four flat wires with an X-Acto knife I could slide the wires through the round hole. As I wasn't sure if the decoder was functioning properly (I couldn't remember why it was sitting in a drawer). I connected the wires to a female 8-pin socket using the 8-pin plug attached to the decoder as a guide. I used small lengths of the correct colors left over from earlier installations to connect the female socket to the wires from the plug and the tender. Heat shrink tubing was used where the color wires joined the black wires. I added the colored wires for a rear headlight (blue for common and yellow for the rear lamp). I drilled out the light housing with a #50 drill and carefully enlarged it. Behind the light I drilled a #54 hole down into the tender body. I pulled a mini-incandescent clear bulb through the housing and fed the wires down into the tender. Before connecting the yellow wire I added a 47 ohm resistor between the bulb and the socket. This reduced the brightness of the bulb and will help it last longer. Remember, DCC track in HO probably has 14 volts on it, not 12 volt as with most DC power packs. While I was at it I added some more weight to the floor of the tender and wrapped the plug and socket with electrical tape as a precaution. I know some advise not using standard electrical tape because it gets sticky when it gets hot, but I didn't have anything else on hand. The final job was to reinstall the tender shell on the floor and put the trucks back on. It's important to make sure the pickup wheels are on the opposite side of the engine's pickup drivers. Usually this means the tender wheels should be on the left side. It's also important to make sure that both trucks are correct. I've know modelers to discard an engine because they kept getting a short and the only problem was that one truck was installed the wrong way round. If you use the opposite wheels in the engine and tender or get the wires to the motor reversed your engine may go backwards when you want it to go forward. This is an easy fix in the software CVs so you don't have to unsolder and resolder the wiring. You can also use the CVs to allow the engine to run on both DC and DCC layouts although if you've gone to all this trouble you probably won't be using it on a DC layout. The coupler pocket on the rear of the tender accepted a Kadee #5. The front of the engine was another matter entirely. I had to file off two little nubs at the front of the pocket. There was no way a Kadee box was going to fit. The pocket was too narrow. I tried using a standard whisker coupler (#148) but it was too low when it lined up with a Kadee gauge. I finally used a coupler with a long underset shank. Kadee long underset shanks are available as standard and as whiskers. (They also sell overset shanks to lower a coupler). I didn't have an underset whisper coupler so I have to forego the centering action for now. I cut down a standard box to make a lid that I could install sideways across the opening and used a Kadee 2-56 plastic screw to hold it in place. As the screw goes up through the pilot it is easier to trim the length if it is plastic. Tip: If you need to cut a screw, thread on a nut past where you want to cut and then back out the nut after you cut. The nut will clean the threads. I put the engine on my test track and used Decoder Pro in Service Mode to program the number. When it accepted the number I knew I had installed the decoder correctly and there were no shorts. I set the starting voltage at 9, acceleration at 2 and deceleration at 3. I didn't try a speed table. When I placed the locomotive on the layout it ran fine. The flanges are a little deep for Code 83 and too deep for Code 70. I hope this gives you a few decoder installation tips you can use. If you have any older steam locomotives with plastic gears the installation is relatively straightforward. You can probably see this without taking the engine apart. Look between the drivers. Go from "decoder-installation-tips" to HOn3 remotoring and decoder isolation.